Parmenter Road and all trails are closed from July 20th to Aug 20th but will be open on weekends from 6 pm Friday eve to 6 am Monday morning. The Blue Mountain Motor Cycle Club would like to express its sincere appreciation and gratitude to BCORMA for its support since 2009. Vedder Mountains' 200+ Km of multi-use single-track trails will be the site for CORMC's upcoming Fun Ride. CORMC (Cascade Off Road Motorcycle Club) at Vedder Mtn in Chilliwack BC have been working hard to get our bridges repaired and trails ready for our upcoming Sunday May 29th Fun Trail Ride. Is Dirt Biking Important to You? BCORMA wants to hear from BC dirt bikers where they want to see their sport in 10 years. What is important to you as a rider? BCORMA will be holding our first Town Hall meeting on Saturday April 23, 2016 in the Lower Mainland. This is an all day event, going from 10 am to 4pm. Lunch provided if you RSVP. Town Hall wil be followed on Sunday by BMMC "Root of All Evil" Fun Ride! BCORMA wants to hear from BC dirt bikers where they want to see their sport in 5 - 10 years. What is important to you as a rider? We are pleased to announce that BCORMA will be holding our first Town Hall meeting on Saturday April 23, 2016 in the Lower Mainland. This is an all day event, from 10 am to 4pm. Lunch provided if you RSVP. Town Hall wil be followed on Sunday by BMMC "Root of All Evil" Fun Ride! CORMC (Cascade Off Road Motorcycle Club) at Vedder Mtn in Chilliwack BC have been working hard to get our bridges repaired and trails ready for our upcoming November 8th 2015 Fun Trail Ride. Mike Fetterer, BCORMA MSF Coach, is excited to be teaching new riders all the basics to be a safe rider and having a great time on a dirt bike. 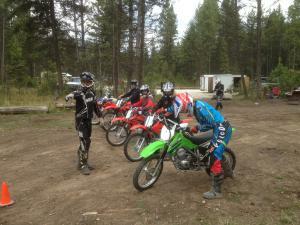 Bear Creek is a great facility, and Honda Canada - Penticton Honda and Valley MotoSport have partnered with BCORMA to provide student dirt bikes for the course. So now for officially perhaps the worst-kept secret around, it is OFFICIAL that we will be using a sticker/decal system of ID'ing ORV's, and mandatory registration has been postponed until November 1st, 2015. Sorry to have been so cagey about this, but it has been a long process, and subject to the confidentiality agreement. However, thanks to consistent pressure from motorized reps in all sectors, we are pleased to have achieved this concession.